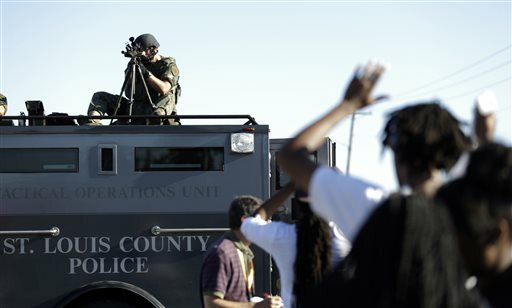 A member of the St. Louis County Police Department points his weapon in the direction of a group of protesters in Ferguson, Mo. President Barack Obama said Monday he wants to ensure the U.S. isn’t building a “militarized culture” within police departments, while maintaining federal programs that provide the type of military-style equipment that were used to dispel racially charged protests in Ferguson, Missouri. Instead, the president is asking Congress for funding to buy 50,000 body cameras to record events like the shooting death of an unarmed 18-year-old Michael Brown and look for ways to build trust and confidence between police and minority communities nationwide. He announced the creation of a task force to study success stories and recommend ways the government can support accountability, transparency and trust in police. Attorney General Eric Holder announced on Monday new Justice Department plans aimed at ending racial profiling and ensuring fair and effective policing. “In the coming days, I will announce updated Justice Department guidance regarding profiling by federal law enforcement, which will institute rigorous new standards — and robust safeguards — to help end racial profiling, once and for all,” Holder said in Atlanta. At least for now, Obama is staying away from Ferguson in the wake of the uproar over a grand jury’s decision last week not to charge Darren Wilson, the police officer who fatally shot Brown. The U.S. Justice Department is investigating possible civil rights violations that could result in federal charges, but investigators would need to satisfy a rigorous standard of proof. Justice also has launched a broad investigation into the Ferguson Police Department. Obama is proposing a three-year, $263 million spending package to increase use of body-worn cameras, expand training for law enforcement and add more resources for police department reform. The package includes $75 million to help pay for 50,000 of the small, lapel-mounted cameras to record police on the job, with state and local governments paying half the cost. Estimates vary about the precise number of full-time, sworn law enforcement officers in communities across the U.S., though some federal government reports in recent years have placed the figure at roughly 700,000. “What happens after the meeting will determine whether we just had a feel-good session or whether we’re moving toward change,” Sharpton said. Cameras potentially could help resolve the type of disputes between police and witnesses that arose in the Ferguson shooting. Some witnesses have said Brown had his hands up when Wilson shot him. The officer who shot him said he feared for his life when Brown hit him and reached for his gun. But there are issues to be worked out — including privacy concerns for police, suspects, victims and bystanders; legal questions over who has access to the recordings; and training to make sure officers are using the cameras and don’t have them turned off at a critical time. The White House said those are the types of concerns that could be addressed by Obama’s newly created Task Force on 21st Century Policing, which will include law enforcement and community leaders. The task force is being co-chaired by Philadelphia Police Commissioner Charles H. Ramsey and Laurie Robinson, a professor at George Mason University and former assistant attorney general at the Justice Department. After the Brown shooting and resulting protests in August, critics questioned why police in full body armor with armored trucks responded to dispel demonstrators. Obama seemed to sympathize when ordering a review of the programs that provide the equipment. “There is a big difference between our military and our local law enforcement and we don’t want those lines blurred,” Obama said in August. White House press secretary Josh Earnest said the president concluded he does not want to try to repeal the programs that are authorized by Congress because they have proven to be useful in many cases, citing the response to the Boston Marathon bombing. “But it is not clear that there is a consistency with regard to the way that these programs are implemented, structured and audited, and that’s something that needs to be addressed,” Earnest said. The White House review shows the wide scope of the programs — $18 billion in the past five years from five federal agencies, including the departments of Defense, Justice, Homeland Security and Treasury, plus the Office of National Drug Control Policy. The report says most of the equipment the programs provide are routine — like office furniture, computers and basic firearms — but about 460,000 pieces of equipment primarily used for military purposes have been provided to local police, including 92,442 small arms, 44,275 night-vision devices, 5,235 Humvees, 617 mine-resistant vehicles and 616 aircraft. Demands for police to wear the cameras have increased across the country since Brown’s death. Some officers in the St. Louis suburb have since started wearing the cameras, and the New York Police department became the largest department in the U.S. to adopt the technology when it launched a pilot program in early September. A report from the Justice Department, which had been in the works before the Ferguson shooting, said there’s evidence both police and civilians behave better when they know there are cameras around. In a recent Cambridge University study, the police department in Rialto, California — a city of about 100,000— saw an 89 percent decline in the number of complaints against officers in a yearlong trial using the cameras. The number of times the police used force against suspects also declined.